Order of the Mishnah and the Tosefta, in both the Babylonian and the Jerusalem Talmud. The name "Neziḳin," which occurs in the Talmud itself (Ber. 20a; Ta'an. 24a, b), is applied to this order because several of the treatises belonging to it deal with injuries and claims for damages. With reference to Shab. 31a it is also called "Yeshu'ot" (Num. R. xiii. ; Maḥzor Vitry, ed. Hurwitz, p. 461, Berlin, 1891). The order stands fourth in the Mishnah (Shab. 31a) and is divided into ten treatises, containing seventy-three chapters in all. The ten treatises are as follows: Baba Ḳamma, Baba Meẓi'a, Baba Batra, Sanhedrin, Makkot, Shebu'ot, 'Eduyot, 'Abodah Zarah, Abot, and Horayot. 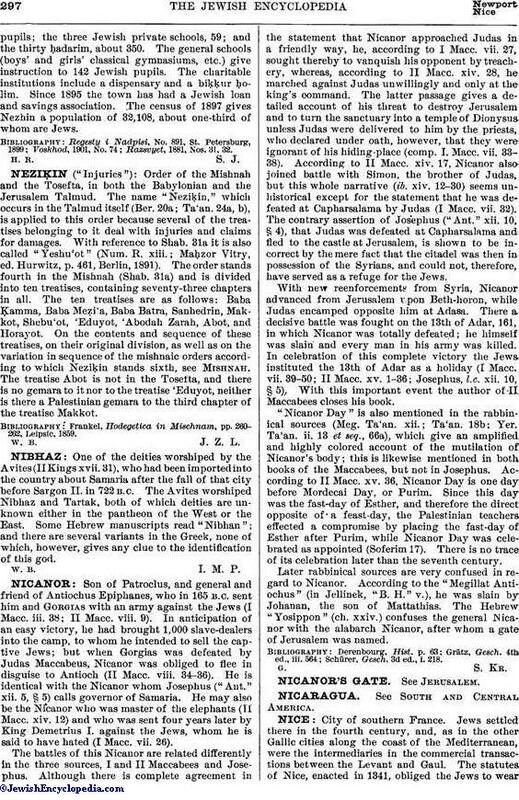 On the contents and sequence of these treatises, on their original division, as well as on the variation in sequence of the mishnaic orders according to which Neziḳin stands sixth, see Mishnah. The treatise Abot is not in the Tosefta, and there is no gemara to it nor to the treatise 'Eduyot, neither is there a Palestinian gemara to the third chapter of the treatise Makkot. Frankel, Hodegetica in Mischnam, pp. 260-262, Leipsic, 1859.